The Trusts Community Foundation (TTCF) continues to support local communities in the form of charitable grants. In the last financial year ending 31st March 2018, TTCF returned just under $12m or 44.3% of its net revenue to community purposes. This compares favourably with the statutory minimum of 40%. It has been a trying year, given TTCF has had to absorb significantly increased costs in the form of commission based venue payments, licensing fees and electronic monitoring fees. Despite this, the Foundation was able to maintain one of the highest rates of contribution of all the nationally based class 4 gambling societies. The TTCF Directors continue to ensure that the communities hosting our gaming machine operations are the ones that benefit, given our emphasis on local distribution. 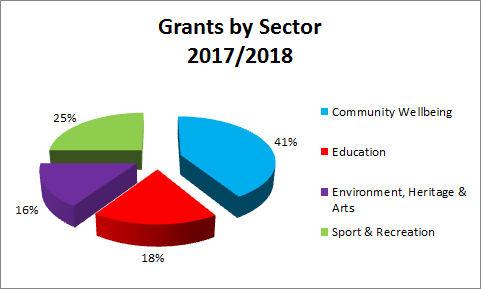 The distribution was also well balanced among the four main categories of grants: Community Wellbeing (41%); Education (18%); Environment, Heritage & Arts (16%); and Sport and Recreation (25%). The TTCF Board consciously adjusts its funding strategies to try and best match each local region’s needs and priorities. This Foundation always receives applications amounting to far more than the funds that are available, with our Grants Office processing up to 200 applications every month. Given the ever increasing demands on the funds we have available, the directors have had to make some tough calls and it is a sad reality that we are unable to support all of the worthwhile causes tabled at our monthly meetings. TTCF has 49 venues in total, 24 of which are privately owned, and 25 which are operated by Licensing Trusts. The directors again acknowledge management and staff of these venues for their continued hard work and commitment in assisting TTCF to raise funds in support of their local communities as well as maintaining professional operating standards. Alongside our loyal long serving privately owned establishments, we currently have 7 Licensing Trust members i.e Cheviot, Clutha, Mataura in the South Island; and Portage, Te Kauwhata, Waitakere and Wiri in the North Island. The TTCF board acknowledges the value in receiving recommendations from the publically elected trustees of the TTCF member licensing trusts, all of whom have extensive local knowledge of their local communities. Elected members of the Johnsonville Charitable Trust also provide recommendations for their local area. The Class 4 gambling sector remains under the spotlight from those within the community that only focus on the negative aspects of “Pokie” machines. The most disconcerting thing for me and my fellow directors is that to date not one of these detractors has acknowledged the significant community contribution derived from this sector, nor have they provided details of any alternative sources of funding for the various community groups currently reliant on this sector. For most people gambling is just another recreational pastime, however it is acknowledged that not all players can control their gambling habits and therefore management continues to work collaboratively with the Department of Internal Affairs (DIA) on a set of initiatives that will help minimise harm for the relatively small number of potentially at risk gamblers. This is over and above the already extensive training our area managers provide to venue personnel at present. Not too many faces have changed within the Foundation’s ranks since this time last year and so TTCF continues to have significant sector related expertise at its disposal. I want to sincerely thank each one of you for your contribution throughout the year and I look forward to seeing the TTCF team produce more exceptional results in the year ahead of us. As Chairman, I personally want to acknowledge the magnificent effort and commitment that prevails throughout communities across New Zealand. Whilst TTCF has an integral role to play in terms of community funding, the various projects and activities that we support along the way simply would not happen if it wasn’t for those that strive to achieve the desired outcomes associated with their respective interest groups. I take my hat off to each and every one of you! In accordance with Section 109 of the Gambling Act 2003, the Net Proceeds Committee of The Trusts Community Foundation (TTCF) Limited has conducted an annual review of the criteria, methods, systems and policies it uses for consideration of applications for the distribution of net proceeds. The results of this review, approved on the 5th June 2018, are that the objective of TTCF to maximise the proceeds that are applied to Authorised Purposes remains unchanged. Likewise, TTCF’s policies are considered to be working effectively to meet this objective. Application forms can be completed online or downloaded from this website, either as a PDF to be completed by hand, or as a Word Template to be saved to your computer before typing into the fields provided. Alternatively forms can be requested from the TTCF Grants Office 0800 882 3583 Ext 2. The Foundation currently holds 11 funding rounds per annum and the close off dates for each round are strictly adhered to. We strongly advise that Applicants check these dates against their project needs. Relevant dates may also be checked on the Foundation’s website. The application form contains a checklist of information and documents that must be included with the application in order for the application to be considered. Failure to provide all the information and any document requested usually results in a request for further information. This leads to delays. Completed application forms and all associated documentation, must then be uploaded online or posted, couriered, hand-delivered, or scanned and emailed to the Foundation up to midnight on the advertised closing date for each funding round. If the application and supporting documentation is submitted electronically, the ‘Consent to Audit & Declaration,’ with original signatures, must be posted separately. On receipt, applications are checked for completeness and compliance. The Net Proceeds Committee of the Foundation then consider each application on a monthly or regular basis. An application will usually take up to six weeks to be processed. After applications are considered by TTCF’s Net Proceeds Committee, applicants are notified in writing of the decision or if further information is required. Applicants should be aware that the ultimate decision on funding rests with the Foundation’s Net Proceeds Committee. There are no guarantees that the full amount of the application will be granted or that the application will be supported at all. If you are a successful applicant, you must only spend the funds on the purpose for which they were applied for. Furthermore, the approved grant is based on the quotes/suppliers and/or contracts for employees submitted with the application. These suppliers/quotes/contracts must be used when expending the TTCF grant. If for any reason a change is required, prior approval needs to be sought in the form of a letter or email request sent to the TTCF Grants Office, accompanied by a quote(s) from the requested new supplier(s) or copy of signed contract for new employee(s). Applicants are required to provide proper accountability to the Foundation once the funds have been spent. Such documents shall include, but not be limited to, receipts, tax invoices and copies of bank statements. Applicants may also be required to undergo an audit to ensure they have fully complied with the terms and conditions under which the funds were provided. Failure to comply with these requirements will result in a demand for a return of the funds and/or all future funding applications being declined. The Foundation is required to use best endeavours to pursue the recovery of funds that have not been spent in accordance with the purpose for which they are given. Any complaints should be directed in writing to: General Manager, The Trusts Community Foundation Ltd, P O Box 27041, Shirley, Christchurch 8640. All complaints will be acknowledged.